Tuesday, 27 October 2015, 7:00 p.m. The year 2015 marks the centenary of Einstein’s formulation of the general theory of relativity. There are three major ingredients that underlie general relativity: The first is the special theory of relativity — formulated by Einstein in 1905 — which demonstrated that space and time are intimately related. In special relativity, space and time comprise a single entity, “spacetime,” and the space and time relationships between events are described by a certain “geometry.” The second key ingredient is the equivalence principle, which simply says that all bodies fall the same way in a gravitational field. Although this fact was well known since the time of Galileo, it suggested to Einstein that the effects normally attributed to gravitational forces actually correspond to a curved spacetime geometry. The final major ingredient was to obtain the equation that relates the curvature of spacetime to the matter content in the universe. It is here that Einstein struggled and went badly off track for several years, but in a remarkable series of papers in November 1915, he succeeded in completing this step. The resulting theory, general relativity, stands as one of the most remarkable intellectual achievements to ever have occurred in science. Robert Wald is the Charles A. Swift Distinguished Service Professor of Physics at the University of Chicago. He is a member of the National Academy of Sciences, a Fellow of the American Physical Society, and a Fellow of the American Academy of Arts and Sciences. He is the author of numerous papers on topics in general relativity, cosmology, and quantum phenomena related to gravity. In addition, Professor Wald has authored two books related to gravity: General Relativity and Quantum Fields in Curved Spacetime and Black Hole Thermodynamics, as well as a popular-level book on Space, Time, and Gravity: the Theory of the Big Bang and Black Holes. 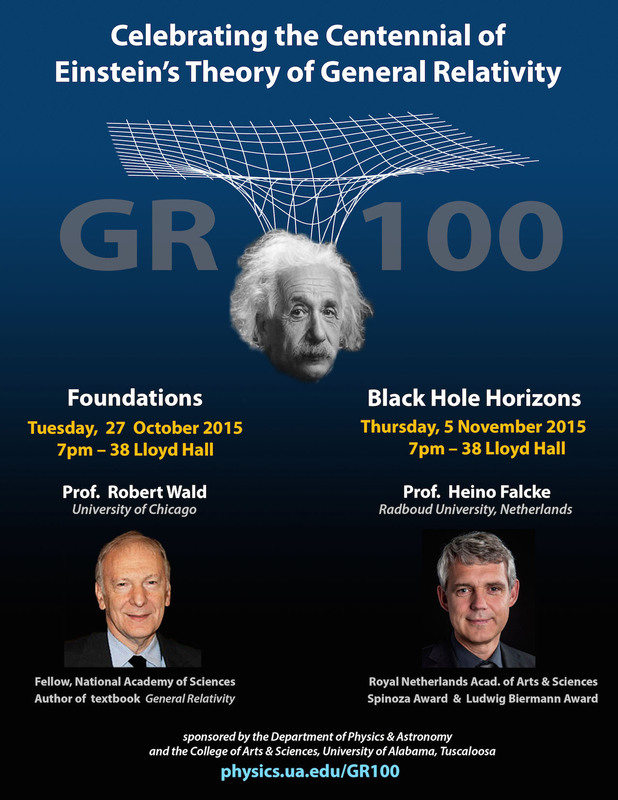 Thursday, 5 November 2015, 7:00 p.m.
Black holes were discovered as solutions of Einstein’s equations a century ago, but we still do not have a complete understanding of them as real objects. We still do not have conclusive evidence for the presence of an event horizon — a black hole’s point-of-no-return surface. The event horizon of the black hole at the center of our galaxy is probably 15 million miles across, but it is 27,000 light-years away. To image it at sub-millimeter wavelengths, a telescope as large as the Earth is required. A worldwide network of radio telescopes can obtain the required resolution. Using such a network, we hope to see how radio waves from the black hole’s surroundings are bent and absorbed, just as in Christopher Nolan’s movie Interstellar. We should be able to observe a kind of central “shadow.” By comparing the size, shape and sharpness of this shadow with theoretical predictions, we can test general relativity. If the shadow is, say, half as big (or twice as large) as predicted, general relativity cannot be correct. Heino Falcke is a professor of astroparticle physics and radio astronomy at Radboud University in Nijmegen, the Netherlands. He is a member of the Royal Netherlands Academy of Arts and Sciences. In 2011, Professor Falcke was awarded the Spinoza Prize, the top science award in the Netherlands. In 2000, he received the Ludwig Biermann Award, the German Astronomical Society award for outstanding young astronomers. In 2013, the BlackHoleCam team he co-founded received a €14 million grant from the European Research Council.